Not everyone can travel more than 8,000 miles from Honolulu to Rome to taste a delectable plate of tagliatelle. But Hawaii boasts several restaurants that bring Italian cuisine to you, which is the next best option. In Hawaii’s best places for pasta, you’ll find Italian favorites such as orecchiette, lasagna, spaghetti alla bolognese, and more, with some dishes featuring a unique Hawaiian twist. Recently winning Honolulu Magazine’s accolade for best Italian, Arancino at the Kahala is a top choice for authentic Italian food on Hawaii, especially if you are seeking a classy restaurant or a celebration. The menu features classics such as rare cooked bistecca alla Fiorentina, linguine alle vongole with clams from Manila, and homemade orecchiette pasta with sun dried tomatoes and brocconlini. Arancino has three different locations in Honolulu for your dining convenience. Taormina Sicilian Cuisine mixes Italian classics with a bit of Hawaiian flare. Serving both lunch and dinner, you can expect to find dishes such as lasagna, spaghetti with beef ragu sauce, and a special dish called Mentaiko, which is spaghetti with roe and mushrooms topped with seaweed for a Japanese-Hawaiian influence. The wine list features more than 125 bottles hand-picked by a master sommelier and features wines from Italy. Assaggio has been open since 1987 on the back of owner’s dream to one day own his own restaurant. 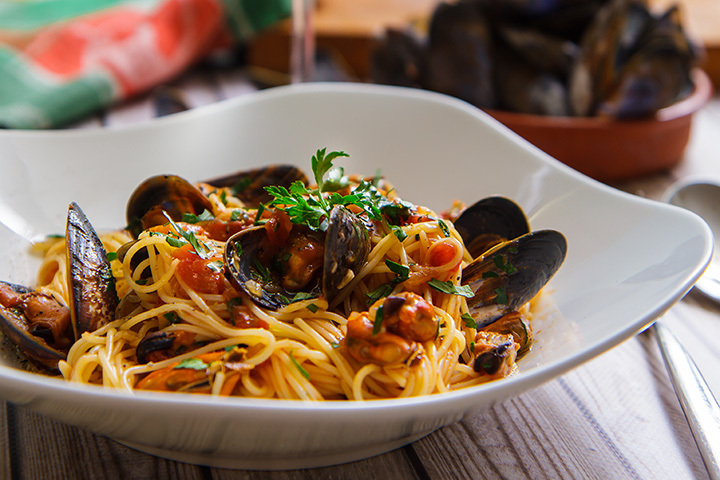 The restaurant is serving for both lunch and dinner and features refreshing classics such as prosciutto and melon, roasted peppers, sausage putanesca, pasta with clam sauce, and pasta with meat sauce. Numerous other tasty options are featured on the menu, and there are several vegetarian options on the menu too. Mi’s Waterfront Bistro offers a serene environment in which to enjoy fresh Italian cuisine. On the menu you’ll find lasagna, spaghetti alla Bolognese, shrimp fettucine, crab manicotti, and more. Mi’s also offers excellent cocktails such as Mi’s Lanai Spritzer. Located in the pristine and relaxing Halekulani resort, Orchid restaurant offers a great two-course lunch special with heartwarming favorites such as homemade lasagna, pasta with meat sauce, pasta with fresh clams, and other pasta dishes made with homemade pasta. If you happen to visit Orchid for dinner, you’ll have an even greater selection of pasta dishes, particularly pastas made with a variety of seafood. Luna crafts seasonal Italian food made with food from local farms and pasta that is homemade daily. Menu highlights include vegetarian pasta, fettucine alfredo, scampi, and pasta carbonara. You can even customize your pasta dishes by adding grilled chicken, homemade meatballs, or Italian sausage. This casual spot is perfect for a relaxed meal out with family or friends in a welcoming atmosphere. Penne Pasta Café is a casual, family-friendly eatery that serves hearty comfort food, perfect for a dinner out with the kids. Look no further for flavorful fettuccine alfredo, linguine with pesto, spaghetti with calamari, and spaghetti and meatballs. These home style classics are served in a casual atmosphere by friendly staff. Originally opened by a New Jersey native who moved to Hawaii, diners can expect to enjoy typical New Jersey style pizza, subs, and pasta. Entrees include lasagna, classic ravioli, spaghetti and meatballs, pasta primavera, and more. Sperico’s is open for breakfast, lunch, and dinner, and they even offer a children’s menu. Café Pesto is a bright, lively eatery that has been open since 1988. Pastas are only available on the lunch menu at Café Pesto, but their creative flavors are worth the visit. Stop by for salmon alfredo pasta, Santa Fe chicken, or pesto marinara pasta with sausage and cheese. Other menu items include pizza and calzones. Bernini is an elegant spot for fresh Italian pastas that incorporate local Hawaiian ingredients. Menu items include chicken carbonara, pomodoro pasta, and pasta with fresh clams and white wine sauce. Other menu items include pizza, steak, and a half-roasted chicken. Celebrate an anniversary in the romantic atmosphere at Bernini, but do keep in mind that this spot is popular, so a reservation should be made in advance.